Episode #332: Superman Comic Book Cover Dated June 1964: Action Comics #313! Action Comics 313: June 1964! ACTION COMICS 313, June 1964, was published around April 30, 1964. It contained 32 pages for the cover price of 12¢. Mort Weisinger was the editor, and the cover was pencilled by Curt S wan and inked by George Klein. 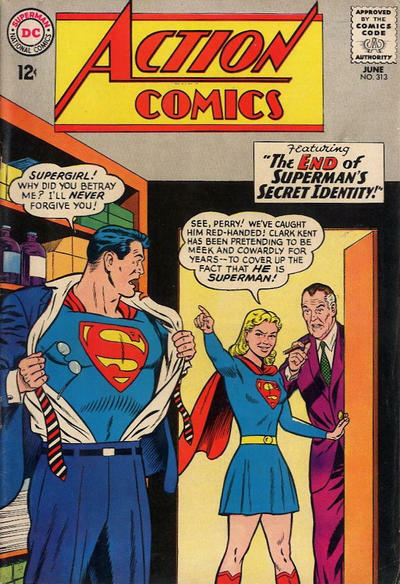 It featured Supergirl's 11th appearance on the cover. - THE END OF CLARK KENT'S SECRET IDENTITY (13 pgs. ), writer unknown, was drawn by Al Plastino and has not been reprinted as of yet. - Supergirl starred in the 12 page story titled, LENA THORUL, JUNGLE PRINCESS, written by Leo Dorfman, drawn by Jim Mooney and lettered by Milt Snappin. This story has also been reprinted in 100-PAGE SUPER SPECTACULAR (DC-21), October 1973, cover price 50¢ and featured Superboy on the cover. This cover was drawn by Nick Cardy. SHOWCASE PRESENTS: SUPERGIRL vol. II also reprinted this story. Elsewhere in DC Comics 31 titles carried the June or June/July 1964 cover date, according to Mike's Amazing World Of DC Comics. We begin 2016 with: SUPERMAN 2015: THE YEAR IN REVIEW! SUPERMAN FAMILY COMIC BOOK COVER DATED AUGUST 1961: PART I: WORLD'S FINEST COMICS 119 & PART II: SUPERMAN'S GIRL FRIEND LOIS LANE 27! Episode #331 Part II: Superman Family Comic Book Cover Dated July 1961: Superman's Pal Jimmy Olsen #54! Superman's Pal Jimmy Olsen 54: June 1961! Download Episode 331 Part II! 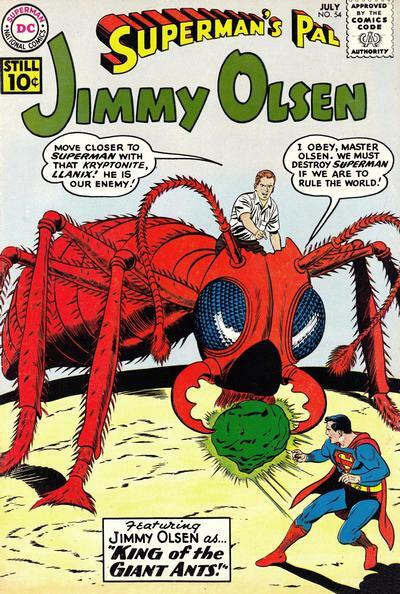 SUPERMAN'S PAL JIMMY OLSEN 54, July 1961, was published on May 18, 1961. It contained 32 pages for the cover price of a dime. Mort Weisinger was the editor, and the cover was pencilled by Curt Swan and inked by John Forte. It featured the issue's second of three stories. The Grand Comic Book Database notes that this cover was inspired by the December 1938 issue of THRILLING WONDER STORIES (just as the previous issue was inspired by the July 1940 issue of the same magazine). - ELASTIC LAD'S WRESTLING MATCH (8 pgs. ), written by Robert Bernstein, pencilled by Curt Swan and inked by John Forte. This story was reprinted in SUPERMAN'S PAL JIMMY OLSEN 111, June 1968, published on April 9, 1968. - KING OF THE GIANT ANTS (9 pgs. ), featured on the cover, was also written by Robert Bernstein, pencilled by Curt Swan and inked by Stan Kaye. This story was reprinted in SUPERMAN'S PAL JIMMY OLSEN 113, August/September 1968, published on June 11, 1968, an 80 Pg. Giant for the cover price of a quarter. - BABY JIMMY OLSEN (10 pgs. ), writer unknown, was pencilled by Curt Swan and inked by Stan Kaye, but was never reprinted as of yet. During this episode I also mention the superhero related Christmas gifts I received and review the November 2015 comic books I received in the MY PULL LIST segment. Next, for the last episode of 2015: SUPERMAN COMIC BOOK COVER DATED JUNE 1964: ACTION COMICS 313! Beginning 2016: SUPERMAN 2015; THE YEAR IN REVIEW! SUPERMAN FAMILY COMIC BOOKS COVER DATED AUGUST 1961: PART I: WORLD'S FINEST COMICS 119 & PART II: SUPERMAN'S GIRL FRIEND LOIS LANE 26! Episode #331 Part I: Superman Family Comic Cover Dated July 1961: Superman's Girl Friend Lois Lane #26! Superman's Girl Friend Lois Lane 26, July 1961! Download Episode 331 Part I! SUPERMAN'S GIRL FRIEND LOIS LANE 26, July 1961, was published on May 11, 1961. It contained 32 pages for the cover price of STILL 10¢. Mort Weisinger was the editor, and the cover was pencilled by Curt Swan and inked by John Forte (whose last name is pronounced "Fort" with the "e" silent), featuring the issue's first story. All three stories were drawn by Kurt Schaffenberger, and have been reprinted in SHOWCASE PRESENTS: SUPERMAN FAMILY vol. IV. 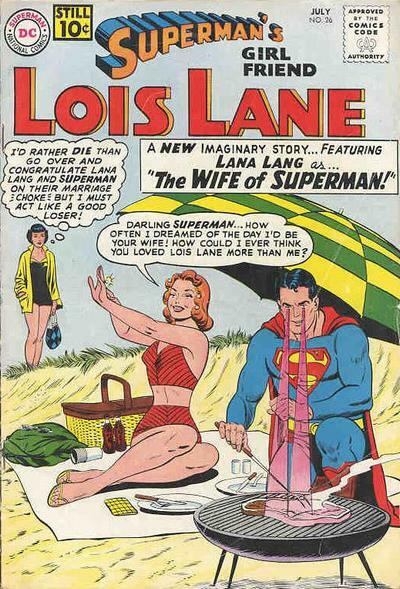 - THE DAY SUPERMAN MARRIED LANA LANG (9 pgs. ), writer unknown according to Mike's Amazing World Of DC Comics, while the Grand Comic Book Database credits Jerry Siegel. The comicbookdatabase.com lists Jerry Siegel as the unconfirmed writer of this story. Because there is some disagreement on the writer credit, we are not adding this story to Jerry Siegel's silver age comic book production. This story was also reprinted in 80 PG. GIANT 3, featuring LOIS LANE, September 1964 and published around July 23, 1964, with the cover price of a quarter. - LOIS LANE'S CHILDHOOD (8 pgs. ), writer unknown, according to Mike's Amazing World Of DC Comics and the comicbookdatabase.com, while the Grand Comic Book Database lists Jerry Siegel as the writer, Again, because there is no agreement on the writer credit, we will not count this story toward Siegel's silver age story total. This story was also reprinted in SUPERMAN'S GIRL FRIEND LOIS LANE 85, August 1968, published around June 25, 1968, containing 32 pages for the cover price of 12¢. - THE MAD WOMAN OF METROPOLIS (9 pgs. ), writer unknown according to Mike's Amazing World Of DC Comics, while the Grand Comic Book Database and comicbookdatabase.com credits not Jerry Siegel this time, but Robert Bernstein. This story was also reprinted in SUPERMAN'S GIRL FRIEND LOIS LANE 77 (G-39), September/October 1967, published on June 29, 1967. It was an 80 pg. Giant for the cover price of a quarter. - SUPERMAN FAMILY COMIC BOOK COVER DATED JULY 1961 PART II: SUPERMAN'S PAL JIMMY OLSEN 54! - SUPERMAN COMIC BOOK COVER DATED JUNE 1964: ACTION COMICS 313! - SUPERMAN FAMILY COMIC BOOKS COVER DATED AUGUST 1961: PART I: WORLD'S FINEST COMICS 119 & PART II: SUPERMAN'S GIRL FRIEND LOIS LANE 27!